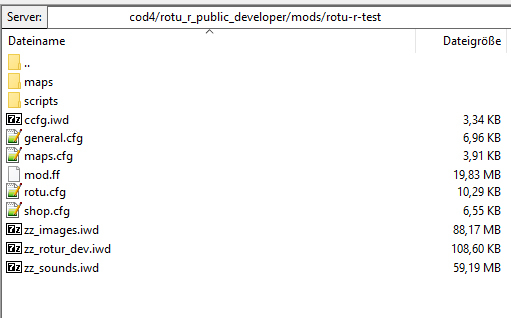 Actually I'm searching the source of any ROTU which work because the project source which is realease on ROTUR the zombies don't spawn. I need it to make a private server just for me and my team and no more. Contact me in private message. The zombies do spawn in the latest sources. Thanks for your offer to provide payment, but this project is non-profit and we sadly don't have the time to provide support for self-compiled versions. Good Luk! a small query, download the code that published the version 1.0, but I have problems, the files were not uploaded at all, when buying weapons I get a weapon, or update the weapon and leaves me without a weapon, I guess for the lack of files , and some weapons appears in FX form, I hope they can upload the missing files, the rest works perfect! regards! between the version of tees that have working and is perfect my only drawback are the weapons? Where could I go down? what they used in that release version? This really good congratulations! and a greetings! The test server has some weapon-order tweaks which are currently not filled into the corresponding .cfg file where they are configured. Since they are by no means final, we haven't adjusted the configs at this point. We highly discourage running the 1.0 files and expecting a working mod. Current time: 26.04.2019, 05:39 AM Powered By MyBB, © 2002-2019 MyBB Group.